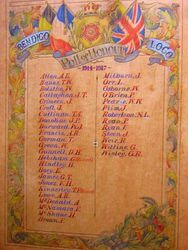 A photocopy of the Bendigo Loco Honour Roll commemorates Bendigo railway employees who enlisted and served in World War One. 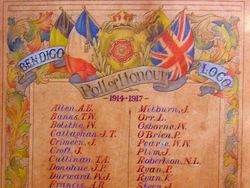 The original honour roll was unveiled on the 7th June 1917 and contained the names of all those on the photocopy with the addition of three names : - A. Campbell, F. Trengove and H. Wilson. The roll was painted by Mr. George Redfern of the railway painting department. Note :- The location of the original roll is unknown to Monument Australia. At the social to commemorate the opening of the Bendigo branch of the Victorian Railways Institute held last evening a tribute was paid to those members who have nobly gone forth in the nation's cause. Mr. A. C. Parker, the loco foreman, in performing the ceremony of unveiling the roll of honor containing the names of 40 members of the service, said they admired their patriotism. Speaking as an old member of the Middlesex Volunteers, he declared that the same spirit animated Australians as was manifested by their kinsmen. He was sure Australian manhood would continue to do its duty in the same way as those who had already made the great sacrifice. (Applause.) He hoped that the time was not far distant when victory would be proclaimed for the Allies and that our brave men would return. (Applause.) Mr. Parker then unveiled the roll of honor, and members stood in silence. 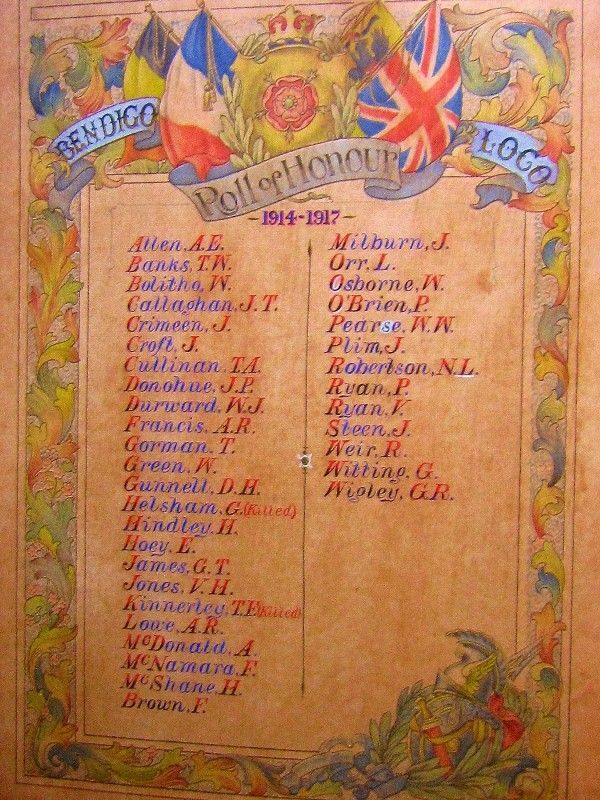 The honor roll was made by Mr. George Redfern, of the painting department. Bendigo Advertiser (Vic), 8 June 1917.